appeared to the folder where they are old or not present and by propagating deletions. 路 Synchronize notebook computer to desktop computer via local network. 路 Keep user files in sync on work and home computer via USB key. 路 Incrementally Backup all files from main hard drive to portable hard drive or another computer. GoodSync can automatically detect and synchronize creation, deletion, and all other changes, made by the user in folders, subfolders, and files. Easy to setup One-Way Synchronization provides an easy and reliable backup solution. GoodSync can propagate your file deletions, even through a chain of Syncs. Changes performed by GoodSync can be transferred to other computers/devices. Example: You can synchronize files between computers A and B which are not connected to each other, by synchronizing Computer A to a USB disk, and then syncing USB disk to computer B.
GoodSync is much faster than other synchronization programs and it takes less memory. It can analyze a job with 1M files and folders on each side in less than 10 minutes on only 500 Mb of memory. GoodSync can sync any two folder located on Windows Local Disk, Windows Network Server (SMB), FTP server, WebDAV server, Secure FTP (SSH) server, Amazon S3 server. GoodSync can sync files on Windows Mobile Phone or Pocket PC device (Windows CE) to desktop. Files can be excluded from synchronization based on name pattern, size, modification time. 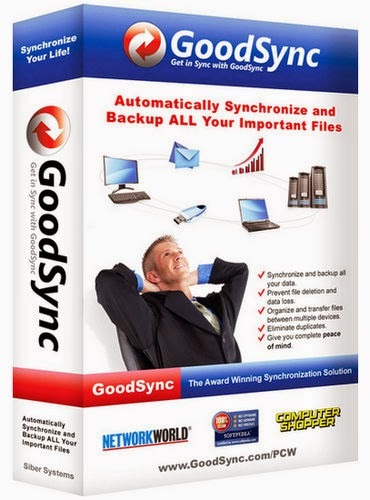 GoodSync for Windows comes both in 32-bit and 64-bit versions. You can specify folder path that starts with volume name, so that your volume is found no matter what disk letter it uses. Changes in files are automatically detected by comparing current file status to the stored file status, so no OS-based file monitoring is required. One folder and its subfolders can participate in more than one sync job, some of these jobs syncing folders above or below this folder. For instance, you can sync folder C:workproject to USB key, sync folder C:work to portable hard drive and file state changes registered in one job will be accounted for by the other job. For GoodSync file and folder names are case-sensitive, that is, Folder/File.txt is not the same as folder/file.txt. So you can easily sync with Internet servers that are case-sensitive. And GoodSync makes sure your file names are the same on both sides of the job, including the case of letters. When modification time of number of files is different by the same whole number of hours, GoodSync can correct file modification time without copying the file. GoodSync uses MDTM FTP command (where available) to get/set precise file modification time. For file systems that do not preserve file modification time when copying, GoodSync implements a novel time translation technique that make mod time appear to be preserved by copy action. If you think that files are the same and they have different modification time, GoodSync can copy just modification time, without copying the file bodies. You can use Windows Encrypting File System (EFS) to encrypt your backups. In GoodSync you can specify encrypted/decrypted status of sync folder. GoodSync can compress one or both sync folders using NTFS compression. GoodSync can copy locked files using Volume Shadow Copy Service. Symbolic links can be copied as links (copy as is) or as files to which they are pointing. Has an option to copy Access Control List (ACL) security attributes of NTFS. GoodSync can limit bandwidth consumed by a sync job by limiting its file copy speed. Can call Unix Diff utility to compare text file line by line. If you backup to Secure FTP or WebDAV + SSL online file systems then all files transferred are encrypted en route. File and folders from both sides are displayed in one combined tree making visual comparison easy. File to be synced are sorted into different groups (All, Left to Right, Right to Left, New Files, Deleted Files, Excluded, etc) and Tree Views allow to see all these different groups in File Tree. Job List pane shows status of all jobs. At every level of your folder tree you will see how many files and how many bytes will be copied. GoodSync can be pre-programmed by system administrator to perform a specific sync jobs and show only minimal Mini-Window GUI. Post-Analyze/Sync Email: allow custom email text with %VAR% parameters. Post-Analyze/Sync Email: shorter default email texts, allow email on PreAnalyze. GS Runner: Fix GS Runner was not reading changes in Global Program Options. FTP: Workaround for Synology FTP server does not return error when listing non-existent file.